The education of high-ability children faces many challenges today, starting with disagreement about which kids we’re even talking about. Fairfax County, Va., defines them as “students [who] exhibit unusual performance capability in intellectual endeavors in one or more academic areas,” identified as math, science, social studies and language arts. When we don’t agree on which kids may be “gifted,” we have no way of knowing how many there are or how many our schools are serving, much less how well their educational needs are being addressed. But that’s just one bump on this gnarly log. In Failing Our Brightest Kids: The Global Challenge of Educating High-Ability Students, we describe plenty more, some within the grasp of school districts but many arising from state and federal policy priorities, educator attitudes and the broader culture. At the macro level, America’s K-12 policies long have focused on ensuring that all children attain a minimum level of academic achievement. This is a worthy goal, and we’ve made some progress toward it. But as educators struggle to close gaps and equalize opportunity, many kids who could soar to academic heights instead languish in classes geared toward modest proficiency. The consequences are well documented. The number of students scoring at the “advanced” level on the National Assessment of Educational Progress is miniscule — and flat. Students in the bottom 10 percent have made greater gains than those in the top decile. And on the latest (2012) round of the Program for International Student Assessment, or PISA, 27 of 34 countries in the Organisation for Economic Co-operation and Development had larger percentages of their 15-year-olds reach the top two tiers in math than did the U.S. The problem is not that we lack smart children. It’s that too many such kids aren’t getting the help they need. A woeful 2 percent of low-SES Americans reach the uppermost PISA ranks versus 20 percent from the top quartile. Plenty more poor children have the ability but lack the supports from home and family that middle-class children enjoy, and many attend schools that struggle with low achievement, places where the pressures on teachers and administrators are to equip weak pupils with basic skills (and, often, to deal with such challenges as discipline, attendance and hunger). Such schools understandably invest their resources in boosting their weak pupils — and state and federal accountability systems push them hard in that direction. They have little to spare by way of energy, time, incentive or resources for students who easily clear the proficiency bar. State policies in this realm are spotty at best. Ohio requires school districts to identify gifted pupils using a five-part definition but has no requirement that districts serve those that they identify. As a result, only about one in five Buckeye students designated as gifted is enrolled in gifted and talented programs. Imagine the outcry if only one-fifth of those with disabilities were served by special education programs! As for Uncle Sam, the one tiny grant program (named for the late Sen. Jacob K. Javits) is only intermittently funded and then with just a few million dollars for the whole country. Behind this low priority — and deterring greater attention to high-ability learners — is America’s anxiety about elitism, fear of discrimination and misgivings about doing more for the already-fortunate. That attitude gets reinforced by the fact that many gifted programs disproportionately serve middle-class white and Asian students but ignores the reality that such imbalances are due in large part to our neglect of other kids who could make it into these programs (and the Advanced Placement classes, selective colleges and career opportunities that follow) if we cultivated their talents from the earliest grades. As if blurry definitions, spotty data, policy neglect and political angst weren’t enough to explain America’s poor showing on high-level academic metrics — and the inequities found among the few youngsters who reach those levels — the research in our book highlights four additional problems afflicting gifted education. First, educators place too much faith in “differentiated instruction” as the way to teach children whose needs, abilities and prior achievement differ widely. (The big exception, again, are kids with disabilities, who get much individualized attention and extra help inside and beyond the regular classroom setting.) Teachers generally do their best but, faced with a class of 26 or 30 kids sprawled across a spectrum of knowledge and ability, they understandably tend to focus on those struggling to grasp the essential material. Second, teachers may temporarily group pupils according to achievement, but the system in general is allergic to ability grouping, especially in the early and middle grades. Yet that’s the best way to cultivate the talents of high-ability youngsters from tough circumstances, whether in gifted and talented classrooms, after-school enrichment, acceleration to the next grade or wholly separate schools. Indeed, the most illuminating research on gifted education shows that those who gain the most from such offerings are children who already are achieving strongly, not those identified through old-fashioned measures like IQ scores. Third, it’s hard to track academic growth among fast learners when assessments top out and don’t ask these kids enough questions to reliably gauge their progress. Computer-adaptive testing could help, but current federal policy emphasizes grade-level metrics, such that a 5th grader never even sees the 8th-grade questions that she or he might be ready to ace. Finally, just as we argue over the definition of giftedness and the best ways of spotting it in children, our approaches to meeting their educational needs are all over the lot. Should they skip a grade? Get something extra after school? Transfer to a special class? Attend a different school? Even in high school, where it’s common to offer at least a few Advanced Placement classes and sometimes programs like the International Baccalaureate, such offerings are most ample in places full of middle-class kids with educated, pushy parents and most meager in schools attended by poor kids. We looked closely at the education of smart children in 11 other nations that mostly surpass the U.S. on international comparisons, including boosting more low-SES students into the ranks of high achievers. No place we visited has a flawless strategy, but we saw several practices that American school leaders could adapt. Most obviously, our standards, tests and accountability schemes should measure, incentivize and reward student growth across the full achievement spectrum. Let’s also strengthen our data systems and research agendas so we can better understand what’s happening to high-ability students and how well our practices and programs are working for them. States or school districts should practice universal screening, using extant assessments to identify the students who are doing best in 3rd or 4th grade and asking teachers to add more children who, in their view, have the spark or drive to excel academically. Once identified, the single best thing we could do for them is make it possible to progress through the curriculum at their own pace — in other words, base progress on mastery, encourage acceleration and create additional options for fast learners. These might include resource rooms, separate classes, after-school enrichment, summer programs and more. None of these is a novel idea, but none, to our knowledge, is systematically practiced in American public school systems, and all would do great good for high-ability students, particularly those whose parents may not be able to help them navigate today’s options. We acknowledge that school budgets are tight, and there’s pressure from many directions to concentrate available resources on the students with greatest needs. Yet the education of high-ability students commands closer attention for two important reasons. Second, the country needs its schools to maximize the education of such children to ensure our long-term competitiveness, prosperity and capacity for innovation. As the American Enterprise Institute’s Frederick M. Hess notes, these girls and boys are excellent prospects to become tomorrow’s scientists, inventors, entrepreneurs, intellectuals and artists. This, then, is a problem of both equity and human capital, a problem that America needs to get much better at solving. 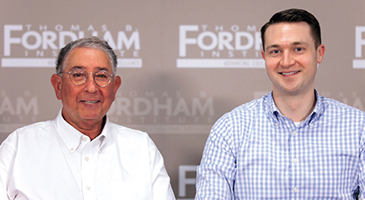 Chester Finn, Jr. is a distinguished senior fellow and president emeritus at the Thomas B. Fordham Institute in Washington, D.C. E-mail: cefinnjr@edexcellence.net. Brandon Wright is a managing editor and policy associate at the Thomas B. Fordham Institute.